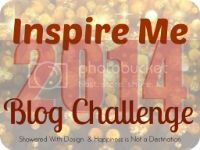 Welcome to Day 10 of Inspire Me 2014! Wednesday, January 15: Write a letter to yourself and don’t open it until the end of the year. It’s fun to see the difference a year can make! I was inspired to include this topic from a letter I wrote in junior high. Our 8th grade English teacher made us write letters to ourselves and she was to keep them and mail them to each of us when we graduated high school. That was an even bigger time span! Of course, the letter back then pretty much said who each of us had a crush on at the time and all that teenage stuff. But it was fun to read! Another year has come and gone. You're amazed that this year flew by even faster. You just turned 25, which is a great milestone! Although there may have been moments of struggle, you once again amazed yourself with the ability to get through it all and make this year your year, like you stated as last year's resolution. When it comes to work, you decided to go ahead and contact the person from the organization you were thinking about volunteering/getting a job at. Good for you! You ended up getting hired and love what you do. You get to help girls see their abilities, help them become more confident in themselves, and inspire them to change the world. There's not a more perfect job out there for you. As for you're blogging, you feel like this year it will blossom and become great. You got a new make over and feel more inspired than ever to write. The first year of blogging was hard but you feel that by giving it your all, you will do great things with it and maybe even make amazing friends. Speaking of friends, you're hoping to meet one of those blogging friends this year. You really don't live terribly far away, so make it happen! You've also lived life to the fullest. You've spent so much time with your family, you finally went on a plane ride with Brian, you've taken way too many pictures, you've become more confident in things you do, and we've went out of your comfort zone. This year was a great one for you...lets make the next even better. Now it's your turn to write a letter! Love your blog makeover! And you wrote this post at 11:11! This year will bring you good look! and I like the letter you wrote!